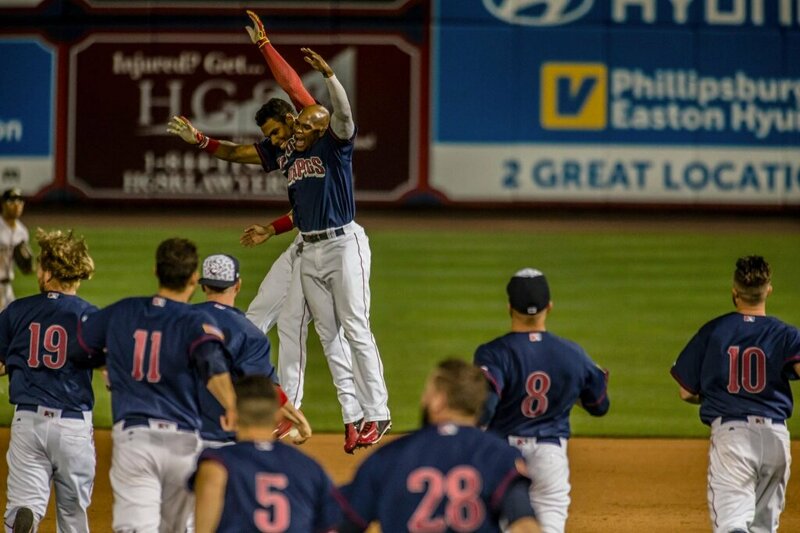 The Chief came in to shut the door in the bottom of the 10th–without even putting a runner on to make himself comfortable–and the IronPigs got a split from the first place RailRiders. The Split in Moosic didn’t help the home-town Piggies gain any ground in the overall or IronRail standings. They remain 4.0 games back of the streaking RailRiders. RHP Yoervis Medina, who had been on the IronPigs DL all season, has been released. OF Aaron Altherr, on the MLB DL with a wrist, may start a rehab assignment next week. Perhaps we’ll see the “Rhineland Rocket” make a stop in Allentown on the way, later this month. RHP Andrew Bailey should be rehabbing with us tonight or tomorrow. Starter shuffling is beginning, in advance of the All Star Breaks–we saw RHP Phil Klein make a spot start the other day for the IronPigs. The Phillies are considering LHP Brett Oberholtzer, LHP Adam Morgan (now in the pen), or RHP David Buchanan for a spot start in Philly tomorrow–late word is that it will be Morgan in place of Nola. In the case of the two former, a reliever will likely go up to help–or else Bailey will be activated. If they call Buchanan, the IronPigs will be short–but there was that extra day in there, so who knows–also where they all end up after the break. RHP power-arm Jimmy Cordero has begun rehabbing his shoulder/tricep with the GCL Phillies. He’s been on the IronPigs DL all season. We’ll likely see him pop up to Reading before making it to Allentown. LHP Daniel Stumpf–the rule 5 pick who had been suspended for PED usage–has been assigned to the IronPigs for rehab. He’ll wear #61. An official roster post will follow if other moves are made. Good seats still remain for this contest. The IronPigs send ace, and Phillies Minor League Pitcher of the Month for June, RHP Jake Thompson (6-5, 2.76) to the mound to face formidable LHP Jason Wheeler (6-1, 2.79) for the RedWings. Weather and Caps: It’s gonna be a hot one, so stay hydrated. I’ve only got a couple more hats to use, so we’ll see if I even make it through tonight–thinkin Fightins. For those vilifying Brundy in this ordeal, do you think he gets to make the final decision on the benchings? Really? If Philadelphia wants Williams in the lineup, believe me, he’ll be in the lineup. Why didn’t Brundage say that night that Williams would be out of the lineup the next day? Was he asked? Who knows, but maybe it’s because it hadn’t been decided yet! The Brundage “ask him” response wasn’t followed by any other questions–at least not that I read from the two or three people I know for sure were in the room. Williams’ subsequent inaccurate response also didn’t get followed-up. Not that anybody wrote, anyway. Some folks were in a hurry to get that “Williams Pulled Again” headline out without checking out the whole story–and get a head start on the “benching” story for the next day just in case he wasn’t in the lineup again. The anti-Brundage columns followed, including whispers of racism, all without the whole story. Not fair to Brundage. This isn’t his first rodeo, and I’m sure Philadelphia makes the final say in these things, and if they were unhappy with Brundage, he wouldn’t be here. Finally, we always want to know that whole story–but sometimes it’s even better not to know how the sausage is made. Some things need to be left in the clubhouse, and “legitimate” media, paid bloggers, internet schlocks like me, and hot takers everywhere need to understand that. I loved a Jake Thompson quote from this post by our buddy Jay Floyd of Phillies Nation and Phoulballz.com. Here it is if you don’t want to read the whole article–I’m a bigger Jake fan right now, I’ll tell you that.